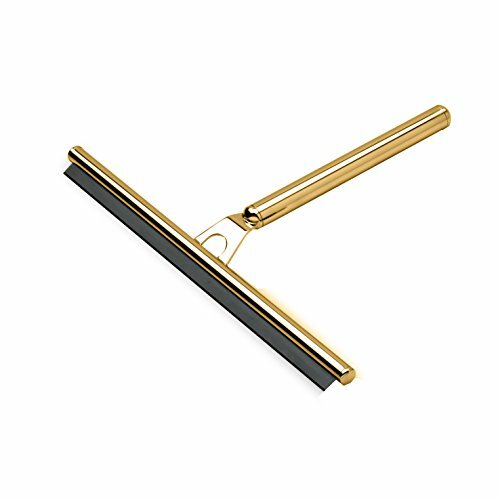 W-Luxury Round Wiper Blade Squeegee for Shower Glass, Windows, Brass. It has never been so easy to wipe your shower door with this Squeegee. Created to bring everlasting beauty; and designed to increase the level of elegance in your bathroom giving a unique touch of elegance. - Manufactured in Spain. - Finish: Polished Chrome, Polished Gold - Material: Brass - Type: Free Standing - Shape: Round - It can be wall mounted by using a wall hanger hook - Dimension: 7.3 W x 9.6 D x 1.5 H in. Dimensions: 7.3 W x 9.6 D x 1.5 H in.